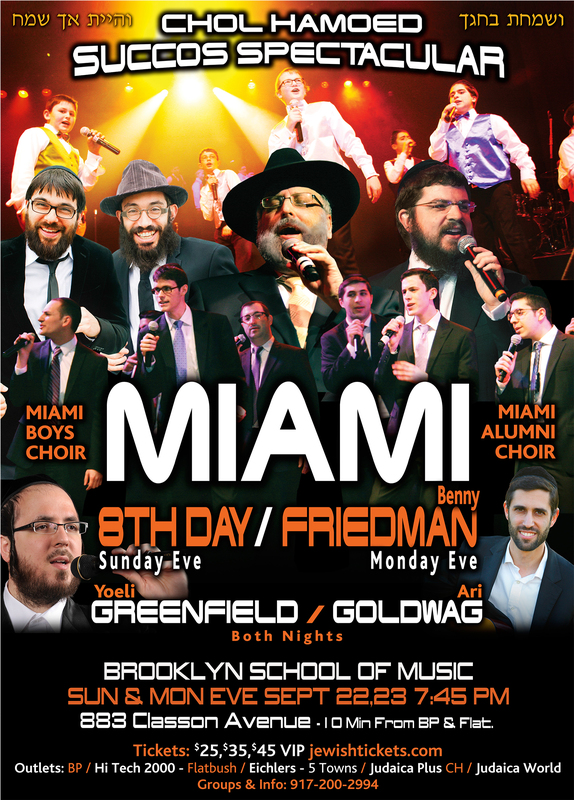 Miami Boys Choir Chol Hamoed Succos with Benny Friedman and 8th Day! Coming to the magnificent Brooklyn School of Music, are 2 amazing current star packed shows, which will cater to all Jewish music fans! Tickets are available at jewishtickets.com. Prices are $25, $35, $45, & VIP. If you purchase tickets online beforeSept 4, prices are $25,30,40,VIP. THIS IS AWESOME!!!!!!!!!!!! SMASHING! I CAN’T WAIT! IMAGINE ARI GOLDWAG RETURNING AFTER ALL THOSE YEARS.. AND THE MIAMI ALUMNI!